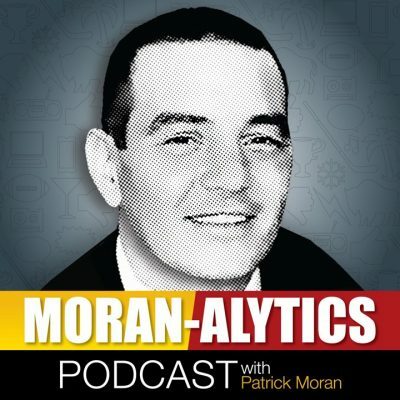 On this episode of the Moran-Alytics Podcast, Patrick Moran chats with Cover 1 podcaster and contributor Aaron Quinn about a variety of topics. The talk about Cover 1, including how Quinn got his start with the site and what makes it unique in how they cover the Buffalo Bills. They also discuss the Cover 1 Podcast and Quinn’s role with it and we learn what Hall of Famer led Quinn to becoming a Bills fan. From there they talk NFL playoffs from last weekend, including being forced to marvel at how the New England Patriots manage to annually play their best football in January. They run down the conference championship games and pick a winner. After that the attention shifts to the Buffalo Bills and Quinn reveals who he considered the team’s MVP this season, offers thoughts on Josh Allen winning him over, spends time identifying some players that would look good wearing a Buffalo uniform in 2019 but realizes many of the players the Bills may target will face stiff competition from Indianapolis. The interview wraps with the Moran-Alytics Interest Meter, where Moran runs off a series of random sports and pop culture topics and Quinn rates his interest on a scale of 1-10 while tossing a few takes along the way, including saucy ones on R. Kelly and O.J. Simpson. Before signing off for the day, Moran hands out his weekly MVP award to the imminent return of one of his favorite TV shows while slapping the LVP on the Philadelphia 76ers for waiting absurdly too long to finally retire the number of one of the team’s all-time greats.